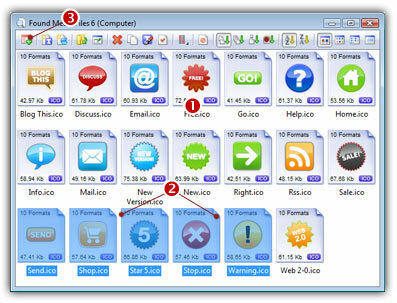 Many files containing icons are present on your computer's hard disks. Axialis IconWorkshop™ includes a search feature to help you locate and grab these icons. 1. Choose Edit/Search/On the Computer or press Ctrl+G. 3. In the "Look In" zone ( ), specify the folder from which you wish to start the search. If you want to perform a deep search (including subfolders), select the Include Subfolders option. 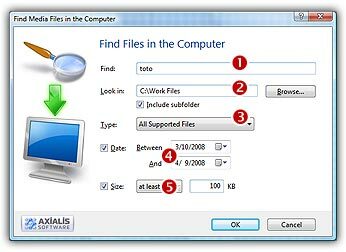 If you specify folder "C:\" with subfolders, the whole disk will be scanned. This can be a very long process! 4. In the "Type" list ( ), specify the type of file you wish to find ("All Icon Files"). 5. You can also specify Date and Size options ( and ). 1. Create a new Icon Library in the Librarian (or select an existing one). Select the items you wish to add to the library ( ). 2. Choose File/Add to the Librarian or press F3 ( ). The files are added.